The NY Times is running a fantastic [free reg required] piece on yesterday's drama: bq. "One of the most frantic takeover battles in recent times ended in the early hours of yesterday morning as a legion of bankers and lawyers for Cingular Wireless scurried on foot through the near-empty streets of Midtown Manhattan to hand-deliver a $41 billion bid that snatched AT&T Wireless from the hands of Cingular's rival." Before Vodafone suits went to bed, they were told by AT&T Wireless that they had won the bidding process. By the time they woke up, Cingular was the new owner of AT&T Wireless. 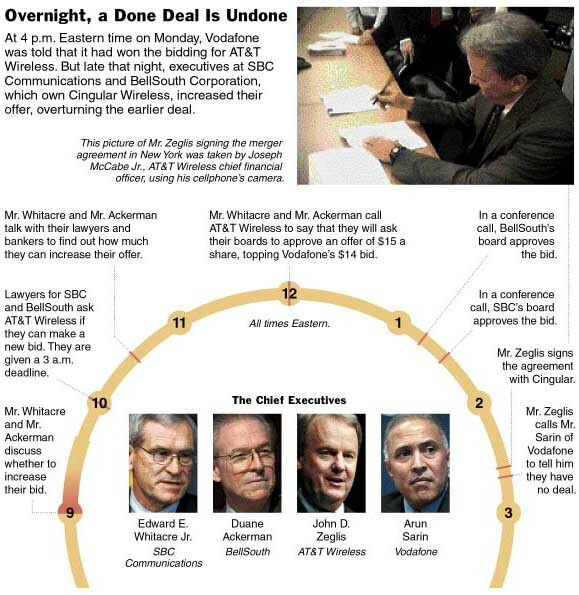 See this graphic for a timeline of events, plus a photo of the AT&T Wireless CEO signing the papers.